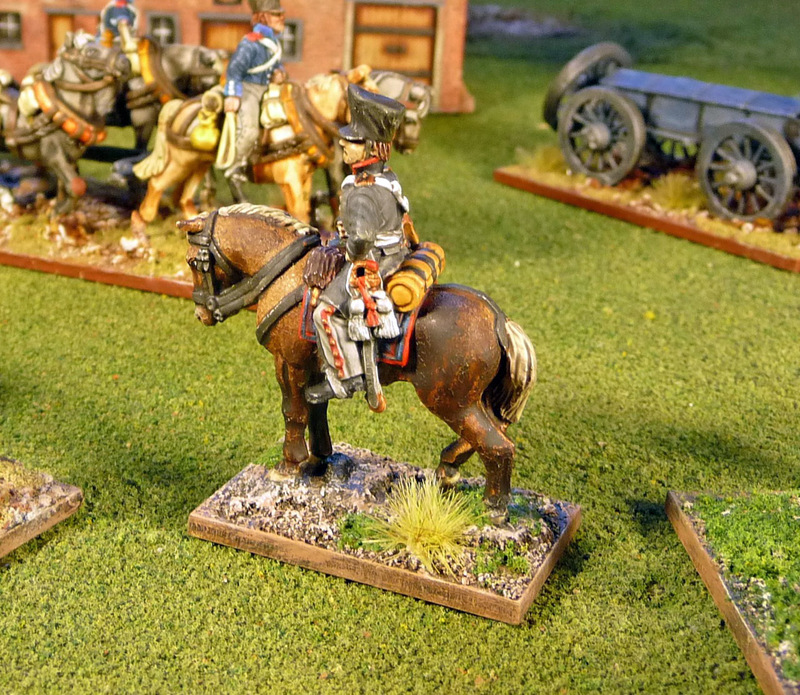 Slowly but surely whittling down the Calpe Prussian metal pile. 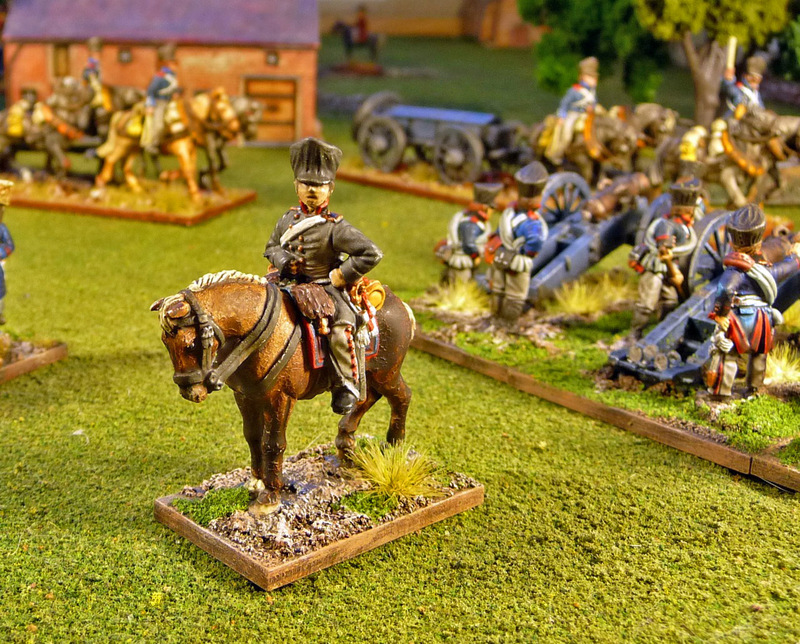 Next up we have two artillery batteries from the IV Corps at Waterloo. 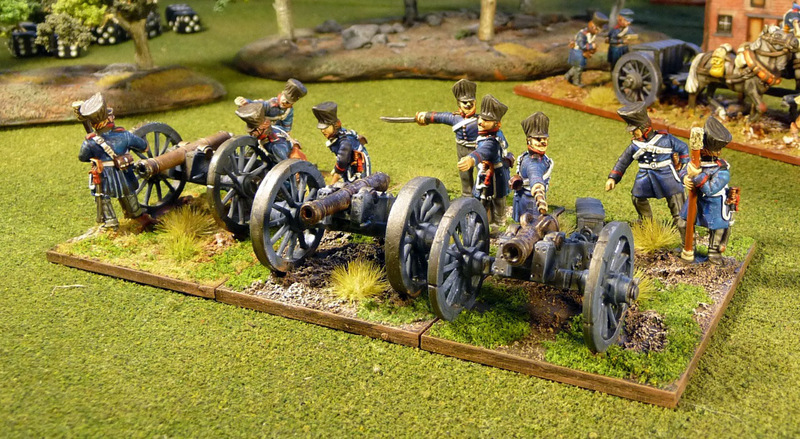 I am getting completely confused now by all the rulesets I have been using, but I think I will probably add a cannon to each battery in the future. I have been primarily playing Black Powder and the one peculiarity about the ruleset is that it requires only one stand to make a battery, which I quite dislike. 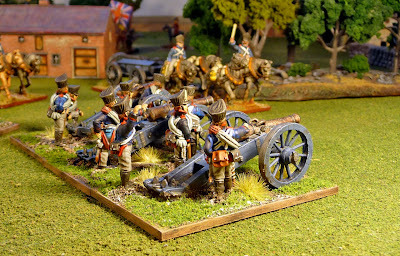 ( does anyone play Black Powder with 4 stand artillery, does it change the game?) Lasalle and most rule sets, I believe, have one stand representing two guns. I like this so for most nations this is 4 stands to an unit aside from Britain and it some it's allies where there would be 3. I do not have nor plan to have Russians, but I believe they would be an exception. 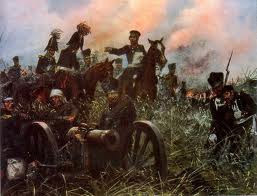 Generally most nations had a fixed ratio of howitzers to cannon, I usually like to put one howitzer to each battery. 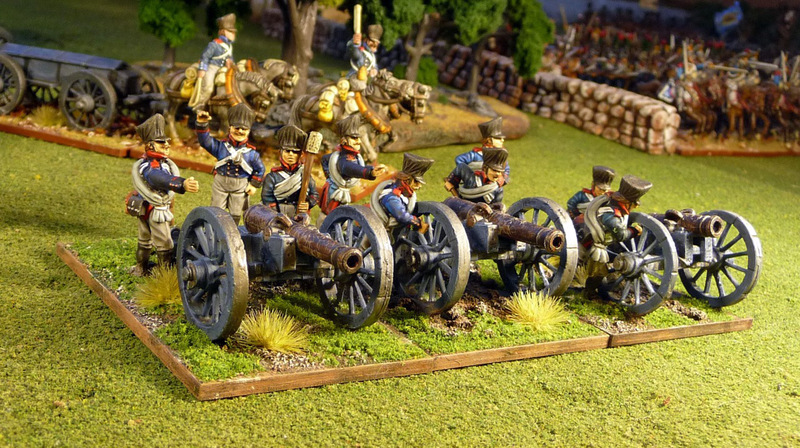 I also plan to have a caisson or limber for each battery. It would be way to expensive to have one for each gun, and one will suffice to represent a limbered battery. Here we have two 12 pound cannon and a 10 pound howitzer. I had some problems with blistering on the cannon tubes. I use a brown ink directly on the unprimed tubes. 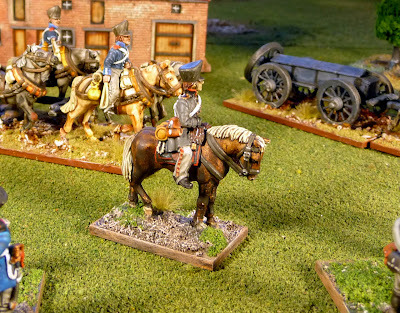 May have to rethink this as the AP or the dullcote appears to react with it. 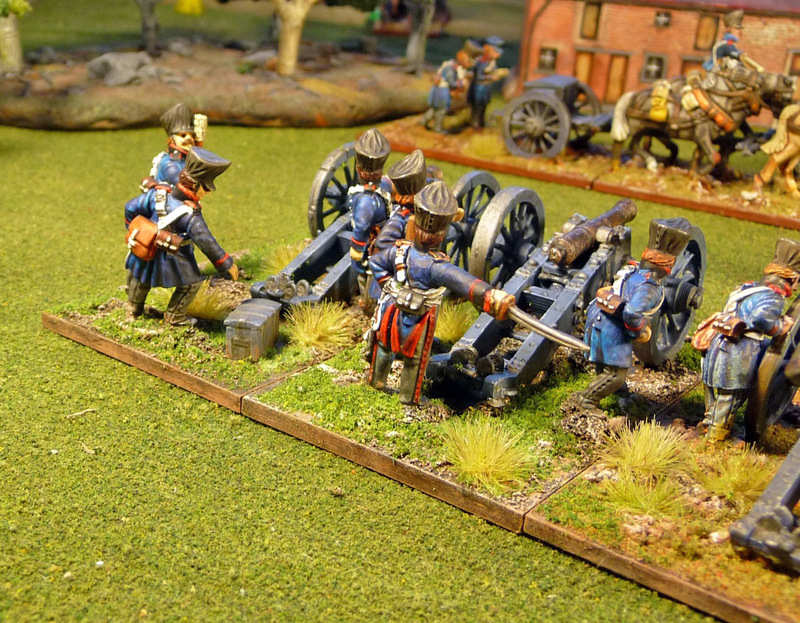 Two 6 pound cannon and a 7 pound howitzer. 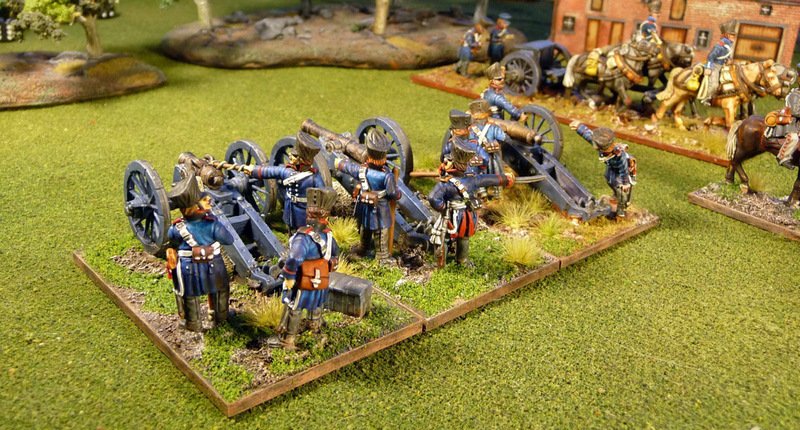 I use GW Fenris Grey for the wood on Prussian Artillery pieces. One cannon was done some time ago as well as the limbers and caissons in the background. Has distinctive red piped black velvet collar. 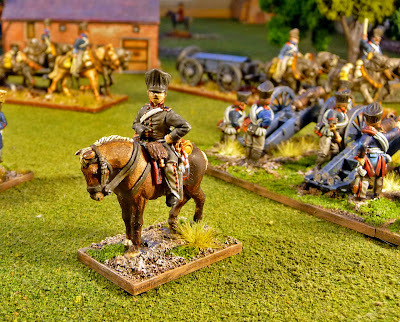 The saddle cloth pattern is also distinctive to the Prussian Artillery. I plan to add a medium Foot Battery as well as a Horse Artillery limber to my Prussian Army and I believe that will be it. 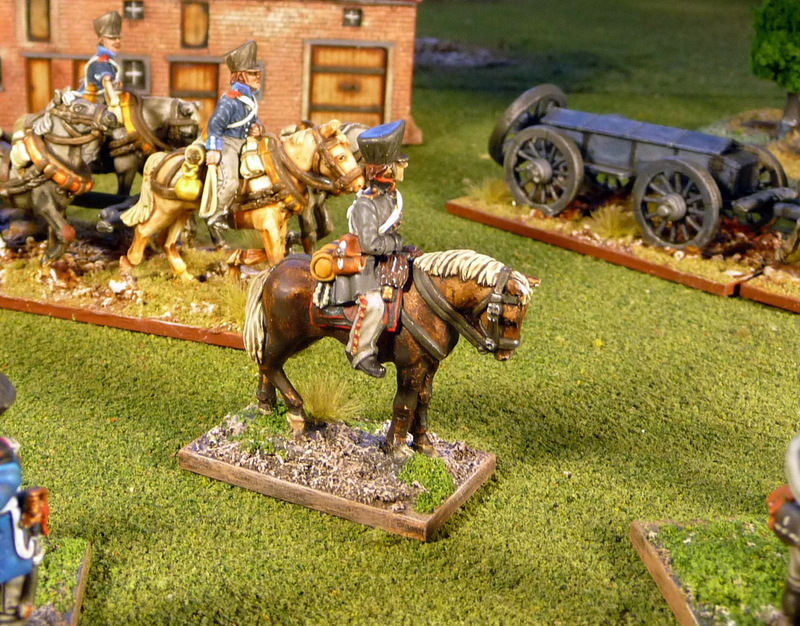 More excellent looking Prussians! and the answer to your question on the painting is Richard Knotel. Thanks Jason, I will give it the proper attribution. Excellent looking figures. This Calpe company makes a very nice range. How compatible are these with the Perry's? Very nice! 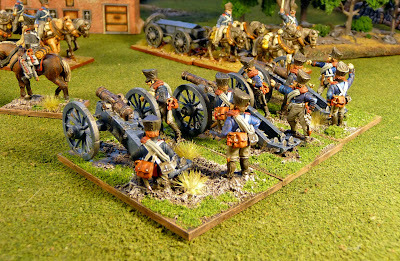 Really need to get myself some 12pdrs and a 9pdr howitzer for a very battery as well! Nice work, John. Yes, before we went on our own path for rules (no slam against BP, we're just opinionated freaks)we simply set down multiple models down for a battery. It looked much, much better. 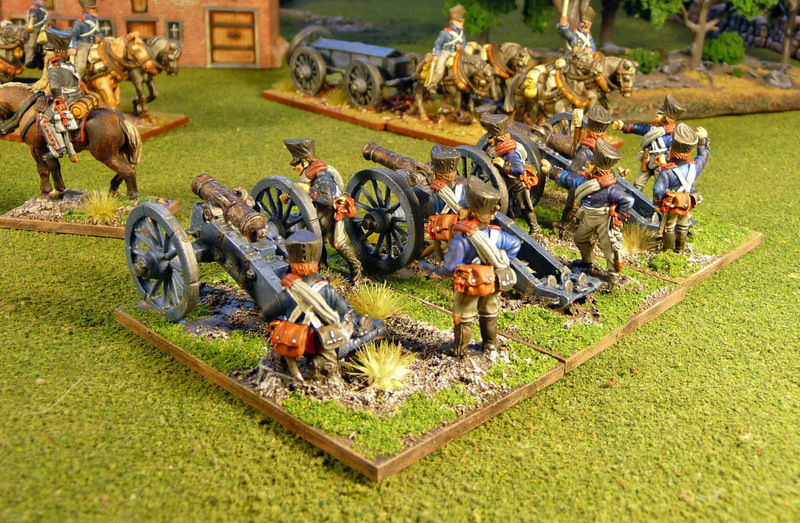 As artillery in BP can be a bit underpowered (it WAS the killing arm of the wars) we began to increase their attack dice to better reflect this. I really like those gins! Great work. They look absolutely fantastic John! Great painting, looking forward to seeing more. Excellent painting job. I like in special the mounted officier in his grey uniform.